New Delhi: Developing countries may get some financial assistance to cope with climate change if the UN’s climate change conference that started in Bali, Indonesia on Monday decides how to use the money in a fund that was created for this purpose. 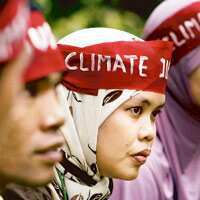 Dissenting note: Environmental activists stage a demonstration outside the venue of the UN climate change conference in Nusa Dua on Bali island on Wednesday. The meeting is focused chiefly on launching a two-year negotiating process to seal a deal to replace the 1997 Kyoto Protocol, which expires in 2012. Money in the so-called adaptation fund is yet to be used; the fund is held by the United Nations Framework Convention on Climate Change and derives its corpus from a 2% cess on carbon credit transactions under the clean development mechanism (CDM). The mechanism allows developed countries, which have agreed to cut CO2 emissions under the Kyoto Protocol to buy credits from carbon reduction projects in developing nations to meet their targets. The fund, however, has thus far accumulated only $67 million (Rs263.98 crore). “India is taking a huge amount of leadership in this case. Our goal is to fill up all the cracks on this by day after tomorrow. India and China are working very closely on this matter and it looks quite positive," said one of India’s representatives at Bali even as a meeting to decide the fate of the fund was on. The representative did not wish to be identified. However, most people say that $67 million is much too less a sum to fund the cost of adaptation. Still, developing nations are eyeing this fund for projects that can ‘climate proof’ their development. Reports by the Intergovernmental Panel on Climate Change have proved that climate change will cause changes in weather patterns, increases in sea level and crop failure. Developing nations, especially island nations and the least developed countries have been demanding the operationalization of the fund as they have already started experiencing adverse effects. “There’s nowhere to move back to," said Anote Tong, president of Kiribati, a central Pacific island nation at the UN conference. “Because if you move back, you’re either in the lagoon or in the ocean." There is informal talk right now about an adaptation fund board, which will be created to receive and approve project proposals in developing nations. “However, there is a slight conflict right now between the the small island nations and least developed countries over who should be the implementing agency for the project in the respective countries," the Indian delegate said. He added that the smaller nations don’t want interference from foreign agencies in their countries. However, it is important to monitor released funds, he said. “There is now a suggestion of developing a minimum eligibility criteria for such agencies and if they are met, then even indigenous agencies can implement these projects," the Indian delegate said. Meanwhile, the delegate added, there will be efforts to find more sources of revenue for the fund.